Last summer I was told about two lads who used to play football for teams I managed in the 60’s, 70’s & 80’s. They are now suffering with Dementia. We’re not medical experts so we can’t say football is the cause but we can’t say it didn’t contribute either. The team I was involved with became very successful at the level they played and both of these lads did a hell of a lot to make the team successful. We played on park pitches as did many hundreds of others in our area so how many of those might now be having a similar problem? On the other hand, how many of the players we watched in the 60’s & 70’s are now having problems? Jeff Astle wasn’t a Liverpool player but many of us will remember him not just as a player for WBA but also England. And maybe we laughed at him when he was singing on the Baddiel and Skinner Fantasy Football show in the early to mid 90’s? 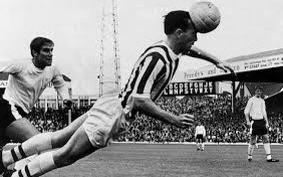 Jeff Astle died in 2002 at the age of 59; he was suffering from degenerative brain disease and also a form of Alzheimer’s and the coroner believed the repeating heading of a football contributed to his illness. The two lads who played for my teams constantly headed a football. It has been highlighted that the Professional Footballers Association do only a little for former players suffering from the various forms of Dementia; those lads who played on park pitches have absolutely no support other than from within their own families or their circle of friends. If a player was knocked out during a game he was revived with either smelling salts or more crudely, the contents from a bucket of cold water. No matter where you live anyone who played park football in the 60’s & 70’s would know what went on. Professionally footballers such would have had better surroundings but whether they had better treatment is a question still to be answered. If you watch a game today when a player gets injured there is almost a full medical team available. Watch those games from yesteryear and it’s a wet sponge and little else. The myth of the magic sponge is just that, a myth. All Red All Over The Land is trying to do, is raise funds for the Dementia Awareness campaign and hopefully give a bit of support to the two players who served local football where I am for over twenty years.